The KAP Foil 1.6 is more than sufficient to carry compact cameras in average winds. 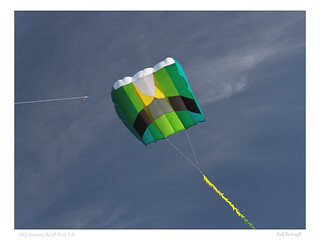 In stronger winds, these kites fly very stable without slipping sideways. Height: 120 cm / 47"
Line rec. : Polyester 90 kg / 200 lb. This product was added to our catalog on zondag 09 februari, 2014.